• Why should we do this? People turn to you for security advice. They expect you to know about eavesdropping detection. They look to you for the truth. Providing them with accurate information and sound advice increases your reputation and credibility. The Security Directors Guide will help you do that. • What should we be protecting? • Do we legally need this type of security? • What’s the inspection process? • Will I receive a written report? • What do I need to do to get this done? • Do you need to see my building first? • Could you give me just a rough idea of the cost? • Who are you, and why should I trust you? 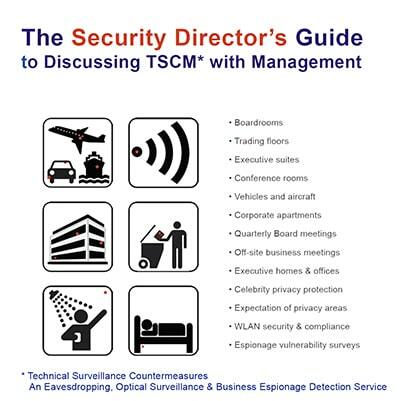 to Discussing TSCM with Management explains Technical Surveillance Countermeasures simply. It also answers many questions about the electronic surveillance detection process. Not surprisingly however, there are dozens of other bug sweep and debugging type questions we hear often. If The Security Directors Guide hasn’t answered all your questions, please see our FAQ page, or contact us directly. Let us know where to send your free PDF download.